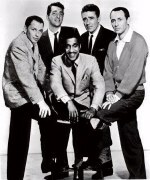 The original Ocean's Eleven, released in August 1960, was shot largely on location in Las Vegas when the Rat Pack was appearing on stage at the Sands at night. It still plays like a "morning after" movie that was filmed whenever the actors could make it onto the set. The new version, shorter on booze and balloons, is getting the kind of prime-time December treatment reserved for more prestigious projects. Looking for imilarities? Well, Frank Sinatra and George Clooney both play guys named Danny Ocean, while their respective romantic co-stars — Angie Dickinson and Julia Roberts — are their fair-haired exes. Don Cheadle, who played Sammy Davis Jr. in HBO'S The Rat Pack, doesn't quite have a parallel role. Davis' character performs some grunt work helping to set the charge that knocks out power in 1960 Vegas, but that caper's key electrician is played by Richard Conte. In the new version, Cheadle is a munitions whiz who puts out the lights all by himself. Despite the O Brother, Where Art Thou? precedent, there are no Clooney vocals in the new film. But in the original, Dean Martin pre-dated Dirty Dancing with "dirty singing." He introduced the now-constantly revived Ain't That a Kick in the Head, a song some radio stations reportedly wouldn't play at the time because they found it off-color. Angie Dickinson as Sinatra's ex, though Frank also has a vindictive Patrice Wymore on the side. An over-the-hill , best known for his 1930 Oscar-winning All Quiet on the Western Front, one of the most socially conscious movies ever made. Red Skelton and George Raft (billed) and Shirley MacLaine (unbilled). The great vibrophonist Red Norvo (billed) backs up Dean Martin's singing at the Sahara. "Give it to me straight, doc; is it the Big Casino? "Ted Nugent wants his shirt back." Nothing is that bizarre in movies anymore!